It is unfortunate when an already unexceptional movie spawns a sequel. “Snow White and the Huntsman” (2012), starring the over-rated, frankly miscast Kristen Stewart as the famous maiden with porcelain skin and raven hair, was a fairly enjoyable, occasionally annoying, but ultimately mindless extravaganza that yielded over $396 million at the box office, inevitably spawning this lesser sequel that, nonetheless, astonishingly, was able to retain not only Charlize Theron as the beautiful but evil sorceress Ravenna (she actually does use the words “Mirror, Mirror, on the wall”), but also the blustery, charismatic Chris Hemsworth as Eric, the titular Huntsman of both films. 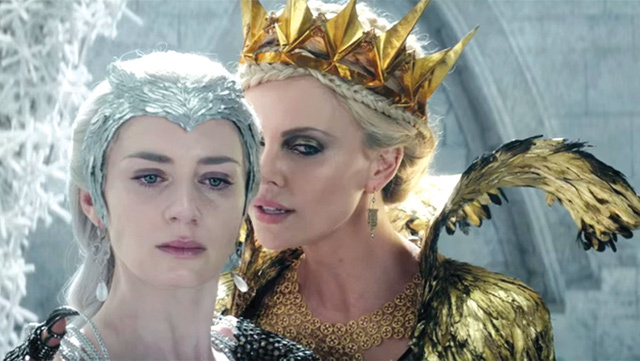 Even more surprisingly, this foolish tale has also gained the incredible Emily Blunt and Jessica Chastain as Freya, the (initially) innocent sister of Ravenna, and Sara, a fellow Huntsman and wife of Eric. In a hodgepodge of a story, which takes elements of Disney’s animated hit “Frozen” (2013), and steals outright from C.S. Lewis’s Narnia books, Freya comes into her magic powers when she is betrayed by her illicit lover who apparently would rather burn their infant daughter to death in her cradle rather than leave his wife. Freya, in a not so subtle reaction to her daughter’s hideous death by fire, becomes a wielder of ice and snow, retreating to the “North” to become a ruthless conqueror of kingdoms, using her “children”, whom she takes from their families, as soldiers or “Huntsmen”, to fight for her ruthless ambitions. Eric and Sara, Freya’s favourites recruited as children, fall in love as adults, defying the wintery queen’s prime rule, that “love” does not exist, and that betrayal is the only thing that can come of it. Eric and Sara are torn apart, and this story, which takes place after Ravenna is defeated in “Snow White and the Huntsman” deals with the fight over the magic mirror, which still holds a great deal of power, and perhaps something even more deadly, behind its malevolent surface. There are a few, obvious surprises that I will not ruin for you here, but mainly, aside from some laughs, one particularly objectionable scene that is extremely rude about dwarfism, and the grim determination of Chastain, Blunt and Hemsworth, there is very little to love about this film. It will keep you mildly entertained on television or in an airplane, but Theron’s one note performance as Ravenna, and the absolute banality of the plot are rarely leavened by the misguided special effects. There are goblins that have been modeled along the lines of gorillas, and Ravenna’s gold ensemble in contrast to Freya’s silvery loveliness can only be described (kindly) as garish. The only other relief is that Stewart’s grating, overly self-conscious Snow White makes no show in this silly, self indulgent fairy-tale.